Fall is a wonderful time of year to get married. 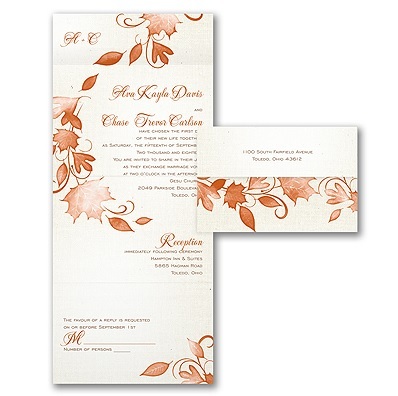 Choose one of our unique fall theme wedding invitations and order online. If you are planning an October or November wedding, start thinking fall leaves and fall colors for your wedding invitations. Invitations styles include elegant embossed leaves with subtle hues to bright fall color invitations that celebrate the autumn season. Fall is a busy time of year for folks so you might want to send out Save the Date Invitations in the summer. Shop our wedding store for fall favors and fall theme wedding accessories.